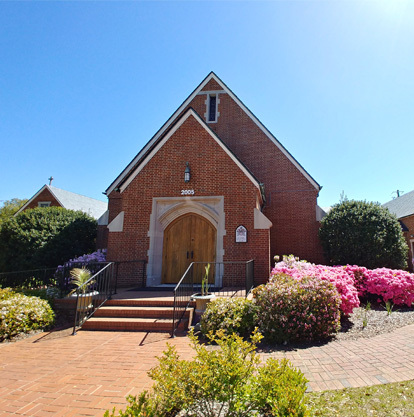 The first services of St. Andrew’s Episcopal Church were held in Morehead City in the year 1919. The Rev. Dr. George Lay, Rector of St. Paul’s Episcopal Church in Beaufort, began holding regular services in order to establish an ongoing Episcopal Church here. In the early 1920’s, a small wooden military chapel was erected near the water at the east end of Bridges Street. The congregation thrived. However, the Great Hurricane of 1933 destroyed the little chapel. Having no other place to worship, members began attending St. Paul’s in Beaufort. Hope for continuing the church was never lost. The land on which the church currently stands was donated by Larry West, a contractor from Chattanooga, TN. Efforts were strengthened raise funds to build a building. Even our current Thrift Shop was begun over 65 years ago to raise money to complete the building. The vision was realized in 1954 when the current Nave (worship sanctuary) was dedicated. The Parish Hall was completed shortly after that. The Educational Wing was completed in 1984. In the year 2000 there was an attempt by some to take St. Andrew’s out of The Episcopal Church denomination. In the end, St. Andrew’s claimed it’s heritage and continues with The Episcopal Church. In 2004 The Rev. Dr. John Pollock was called to serve St. Andrew’s; and the Mission Statement was adopted which calls us to “Follow Christ without delay; and Bring Others into Christ’s Gracious Presence.” This is who we are. St. Andrew’s continues a legacy of outreach, welcome, evangelism and worship set by our founding members so many years ago.